In all sports, there is an award for Coach or Manager of The Year. There are MVP and other individual awards as well as accolades for executives. But there is one position which tends to get overlooked or is considered unheralded in the public's eyes. Being a trainer may not involve throwing, hitting, etc... however, these individuals are the Hidden Gems of a team's success. Former Pistons Trainer Mike Abdenour was an intricate part to Detroit's three championships. 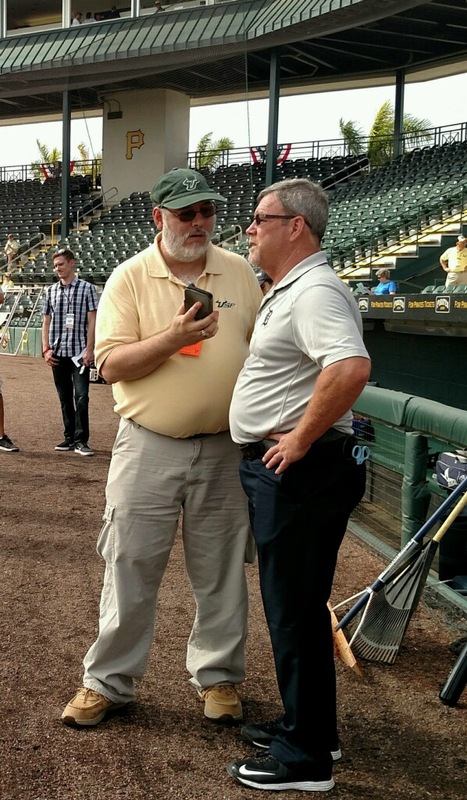 The man in charge of keeping the Detroit Tigers healthy is a person that I've known since 1982 when he worked with the Florida State League's Fort Lauderdale Yankees. His name is Kevin Rand. Rand began as a minor league trainer for the New York Yankees from 1982-1992. He's in his 35th season in Professional Baseball, 24th at the MLB Level and is in his 14th year with the Tigers. His year round residence is Lakeland FL. He is married and has four sons. During his tenure with Detroit, he's witnessed the highs and the lows. His efforts have been instrumental in two Tigers World Series Appearances. During Spring Training at McKechnie Field in Bradenton, FL, home of the Pittsburgh Pirates, I had the opportunity to interview My Long Time Buddy as we discussed many topics. Q: What was the 2015 Season like for you? A: Last year was a real weird year. It seemed as though we had a tag team of injuries. We would get one guy back, then lose another. We lost Justin Verlander early in the year, then Alex Avila, lost Victor Martinez early, then Miguel Cabrera got hurt. We lost a couple of starting pitchers. Overall, it was just a strange year in that way. Q: Was this one of the most difficult years you've ever had to deal with through the years as a trainer? A: Yes, absolutely! We take pride in ourselves. We actually had the lowest number of man games lost the past five years, but last season we lost a lot of quality players that were getting hurt, and didn't have enough depth to cover that. Q: One area that got saddled last year was your pitching. It started off badly at the beginning with Verlander going down at the end of Spring Training, and the list goes on and on. What was that like for your staff? A: You're not going to replace Justin Verlander, who got hurt early that easily. We had difficulty there. Once we got him back later in the season, we lost Anibal Sanchez and Daniel Norris. They were two guys out of our rotation later in the year. It was definitely a challenging year for us in that regard. Q: How tough is it for a trainer where you have players in and out of the room all the time? A: Our job is to get everybody out each and every day. Unfortunately, last year that didn't work that well for us as it had in previous years for us. Every team is going to have their injuries, but at the end of the day, the team that's more successful is the team that has the depth to handle the injuries they have. Last year, we weren't that club. Injuries to our pitching staff meant that we didn't have enough depth to cover those losses. We had injuries to Victor Martinez, Miguel Cabrera, and you're not going to replace those players easily. They're above and beyond some of the other players. It was a tough year. Q: We talk a lot about depth. Do you like a lot of the moves that were made in the off-season? A: Yes, absolutely! I think Al (Avila, General Manager) and Brad (Ausmus) did a tremendous job addressing the needs of our club. We've improved in starting pitching with Jordan Zimmermann. The trades that were made at the end of last summer, we brought in some good young arms with Matt Boyd, Daniel Norris, and Michael Fullmer. We have depth there now. We improved our offense with Justin Upton. Most importantly, we improved our bullpen which was a tough spot for us last year with Francisco Rodriguez, Mark Lowe, Justin Wilson working the back end of the bullpen. I think we're going to be a solid club. Our problem last year is we had guys that were put in situations that they weren't accustomed and capable to being in because of injuries. That's where you run into issues. Q: It seemed like a lot of your pitchers weren't ready to play in the major leagues in 2015. Do you agree that because of circumstances and lack of depth, that they were thrown into the fire? A: That's definitely accurate because of our depth. This year if one of our starters goes down, we have those young kids. We're definitely more covered than we were a year ago. Q: How much better is Verlander this year? Is he much better physically than he was a year ago? A: Oh yes, without a doubt. He was having a great spring last year before he got hurt at the tail end. Right before the season started that hurt us pretty well. But he's in great shape, he's having a great spring and so all are all those guys. Victor Martinez and Miguel Cabrera also look good. Just having those guys back along with the depth is a good sign. Q: Is Verlander capable of throwing in the high 90's on a regular basis or do you think he might have to go ahead and slightly alter himself. I'm not talking about re-inventing himself to become a more crafty hurler like former Tiger Frank Tanana. A: I'm not worried about velocity. I'm worried about guys pitching and making the pitches. You can throw as hard as you want, but if you don't have location, these are professional hitters and they'll hit you hard. Good pitchers understand this. Justin Verlander will make his adjustment as he needs to. If he's going to throw in the high 90's, that's great. It's more about location and making his pitches. Q: I know the Jordan Zimmermann signing was a huge acquisition. Everybody seemed excited about it. What was your reaction when he became a Detroit Tiger? A: It was outstanding because Zimmermann is a proven veteran, a good pitcher, a pitcher who historically takes the ball every fifth day and competes. He's one of the elite pitchers in the game. Q: Last year, there was unjust criticism of Brad Ausmus. Do you think a lot of people were out of line because of the numerous injuries Detroit sustained? The 2015 Tigers looked like a MASH Unit. A: Absolutely, no question. To me, any criticism directed his way was totally unfounded. I look at it the other way. He did a tremendous job with the group of players that he had. He withstood everything and maintained his composure the entire way. You know what, we couldn't put the product on the field. The players on the field played for him, and once again, he did a tremendous job. We didn't put the parts and pieces to compete in our bullpen. He made it work the best he possibly could. I'm excited for him and if you give him a good team this year, and we're able to keep guys on the field, then we'll be fine. Q: I don't care how experienced you are as a manager, we've been around baseball way too long and know that no manager could have worked this way through all of last years adversity. Do you agree? A: Yes. Managers are only as good as the players you give them. At the end of the day, you can look at all the great success stories throughout the years, and if those managers didn't have great and healthy players, they weren't very good managers. Brad did a tremendous job with what he had. We have a better club this year so hopefully we can keep everybody out there. There will be tough stretches where we lose some games and there are peaks and valleys. There will be no need to panic if this happens. We have a better offense and a better bullpen. But when it's all said and done, we'll be in contention the whole season. Q: Do you have enough pitching depth to make it through 2016? A: This year, if we have a pitcher that misses a start, goes on the disabled list for an extended period of time, we have guys that can compete. I don't think we had that last year. We're in a much better position this year. Q: What are your thoughts about Justin Upton? A: He's a great kid. He has lots of talent and a guy that plays everyday. I'm real excited to see him play this season. Q: Is the middle of the Tigers lineup with JD Martinez, Victor Martinez, Justin Upton and Miguel Cabrera going to be scary for opposing pitchers throughout the course of a 162 game season? We all know that there will be slumps along the way. A: It's a pretty good offense if I say so myself. We'll be a factor to be reckoned with. Q: Finally, what should Tigers fans expect to see from this squad in 2016? We know it will be a long season and that's the great thing about baseball, where it's a marathon and not a sprint. A: You're right about that. I think the fans will see a team that will compete and come to play every night. We're in a real good division with (World Champions) Kansas City, and Chicago has made some moves. Cleveland has improved themselves a lot. We're in a real good division and it will be a dog fight. I think it will be a fun year to be honest with you. So far, the early returns on Zimmermann have be really good. He was named American League Pitcher of The Month For April as he went 5-0 with a 0.55 ERA in 33 innings. Zimmermann lost a tough 3-2 decision to the Washington Nationals and his record dropped to 5-2 with a 1.50 ERA. He's 0-2 in May thus far. On this night, former Tiger Max Scherzer tied an MLB record with 20 strikeouts and improved his record to 4-2 for the Washington Nationals. Fullmer was the winning pitcher in Tuesday night's 5-4 triumph. He's 2-1, and gained a much needed win for the Tigers enabling Detroit to snap a seven-game losing streak. For those looking to see Ausmus get fired, that move would be way too premature at this point. As Rand and I talked about, it's a long season. Tigers fans hope that during the course of the 2016 season that Rand is Detroit's Real MVP. They have to hope he'll continue to use his 35 years in Professional Baseball to make sure his staff presses the right buttons to keep the players on the field. Scott Morganroth can be reached at www.scottsports33.com and is a member of The Detroit Sports Broadcasters Association.